Phobos is the larger and inner of the two small moons of Mars. Its most impressive feature is the crater Stickney, some 9 kilometers (5.6 miles) across, or about 40% of the diameter of the moon. It is named after Angeline Stickney (1830–1892), the wife of American astronomer Asaph Hall, who discovered Phobos. She is known for her persistent encouragement of her husband as he strove to track down the Martian satellites. The formation of this comparatively huge crater would have involved an impact which almost shattered the little satellite. High resolution images of Stickney, obtained by Mars Global Surveyor and other Mars probes, have shown it to be filled with fine dust and have provided evidence of boulders sliding down its steep sides. Material around Stickney's rim is bluer than elsewhere on the moon's surface, as can be seen in the false-color image below taken by Mars Reconnaissance Orbiter. The lighter, bluer color suggests that the material is younger, or more freshly exposed to space than the rest of Phobos's surface. 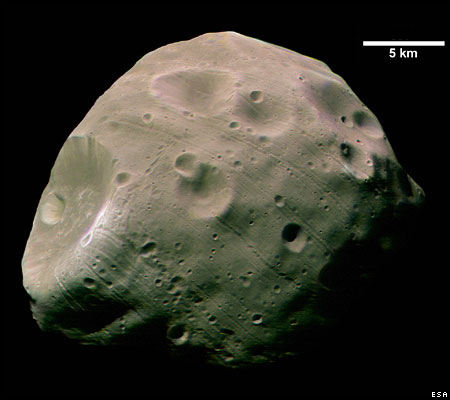 Phobos also has other scars that indicate a violent past. Much of its surface is gouged by parallel troughs and pockmarked by chains of craters. These may be have been caused by debris thrown out by meteorite impacts on Mars. The temperature of Phobos varies between about -4°C (25°F) on the sunlit side of the moon and -112°C (-70°F). 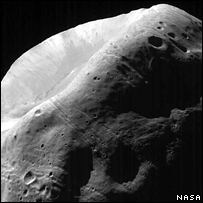 Like Deimos, Phobos has the dark appearance of C-type asteroid and may well be such an object that was captured by the gravitational field of its primary in the remote past. Since Phobos orbits around Mars faster than the planet itself rotates, tidal forces are slowly but steadily decreasing its orbital radius, by about 1.8 meters per century. Some 50 million years from now Phobos will crash into Mars surface or be broken apart before that, possibly to form a ring, when it falls within the planet's Roche limit. Deimos, on the other hand, is far enough away that its orbit is being slowly boosted instead. In 2009, Russia plans to launch a robot probe to Phobos to carry out a sample return mission. There have also been suggestions that the little moon would make an ideal manned outpost. Its extremely low surface gravity, less than one-thousandth that of Earth, would require a far smaller expenditure of fuel for landings and take-offs. Furthermore, meteorite impacts may also have blasted samples of Martian rock onto the surface of Phobos, where astronauts could easily collect them and bring them back to Earth. Remarkably, Phobos appeared first in fiction (although unnamed) before it was discovered in reality. In the third part of chapter 3 of Gulliver's Travels (1726) by Jonathan Swift, the astronomers of Laputa are said to have discovered two satellites of Mars (see Jonathan Swift and the moons of Mars. 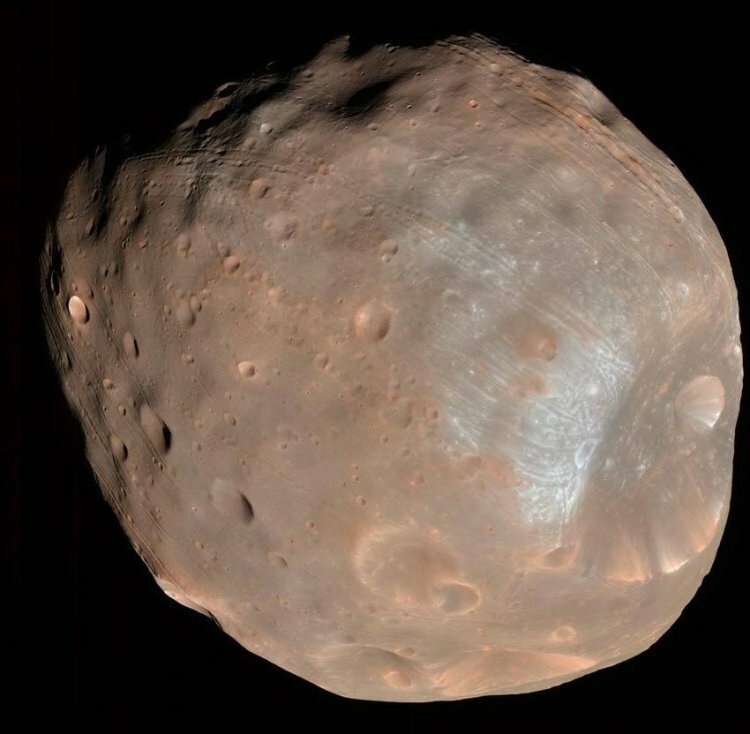 In his Barsoom novels, Edgar Rice Burroughs calls Phobos by the local name Thuria, and is describes it as "a great and glorious orb, swinging swift across the vaulted dome of the blue-black night, so low that she seemed to graze the hills" (The Chessmen of Mars). John Carter of Mars visits a miniature civilization on Thuria in the novel Swords of Mars. Phobos also features in Kim Stanley Robinson's Mars trilogy as the site of a base built by the first Mars colonists.